DALLAS, Pa. – Senior Cråaig Needhammer (Lansdale, Pa./North Penn) ran for a career-high 239 yards and sophomore Blake Bowman (Valley View, Pa./Tri-Valley) added 149 yards to lead the Lycoming College football team to a dominating 28-14 win over Misericordia University in Middle Atlantic Conference action at Mangelsdorf Field on Saturday, Nov. 1. Needhammer’s 239 yards is the third-highest total in school history, behind only two performances from Tim Deasey in 2001. He also moved within 285 yards of the school’s all-time rushing record of 3,665 yards set by Josh Kleingelter (2007-10) and the 200-yard performance helped him tie Brian Thompson’s school record of 15 100-yard rushing games set from 1995-98. The Warriors (6-2 overall, 5-2 MAC), who secured their fifth straight winning season with the win, got on the board with their second drive of the game, heading 76 yards on 10 plays to score with 2:20 left in the opening quarter on a 10-yard pass from senior Tyler Jenny (Glasgow, Pa./Glendale) to senior tight end Matt Cookson (Morrisville, Pa./Morrisville). Needhammer was the leader of the drive, posting eight carries for 49 yards. Misericordia responded by getting the ball to the Lycoming 17, but senior Tanner Troutman (Hegins, Pa./Tri-Valley) picked up his 15th career interception at the two-yard line and Lycoming marched 89 yards on 12 plays to score, with Jenny finding junior Corey Talerico (Moosic, Pa./Riverside) for a three-yard score to make it 14-0 with 5:49 left in the half. The Cougars cut the lead in half just 85 seconds later, as Jeff Puckett found Juwan Petties-Jackson for a 47-yard touchdown, which made it 14-7 at halftime. 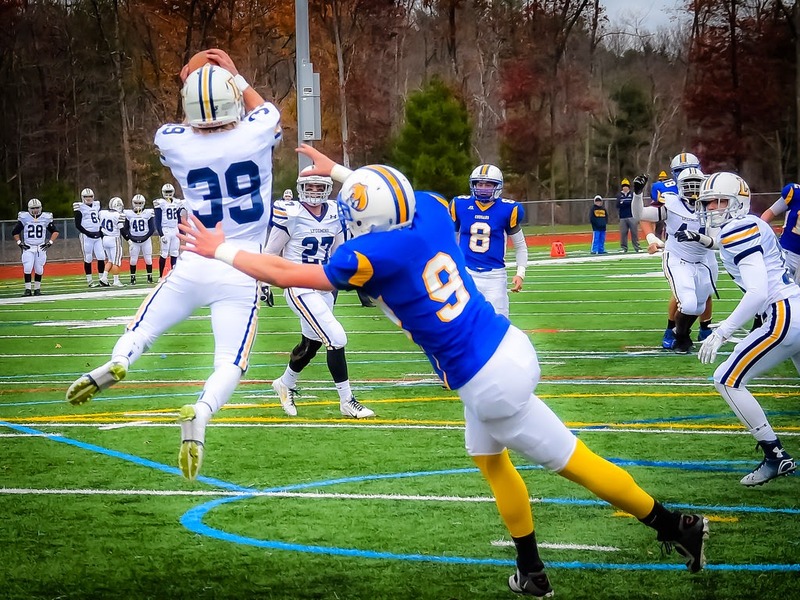 Lycoming was forced to punt on the opening drive of the second half, but a punt by junior Ryan Umpleby (Forest Hill, Md./Fallston) was fumbled and recovered by sophomore Mike Neuman(Lumberton, N.J./Rancocas Valley Regional) at the Misericordia 28. Seven plays later, Needhammer climbed over the pile for a one-yard score for his 10th score of the season. After two stalled Cougar drives, the Warriors struck again late in the quarter, as Bowman broke free with a 52-yard touchdown run to round out Lycoming’s scoring with 58 seconds left in the third quarter. The Cougars closed within two touchdowns with 11:43 left in the fourth quarter, as Puckett fired a 22-yard touchdown pass to Ryan Kurtz to cap a 12-play, 82-yard drive. The Warriors drove to the one-yard line on the ensuing drive, but a fumble recovered by Dom Picarillo in the end zone gave the Cougars life. The Cougars drove to the Lycoming 25 yard line, but junior Phil Schron (Albrightsville, Pa./Marian Catholic) made a stop one yard shy of the first down on Ryan Kurtz to give Lycoming the ball back with 1:22 left, effectively ending the comeback attempt. The Warriors finished with 386 yards rushing and 503 yards of total offense while holding Misericordia to 355. Jenny finished 12-of-21 for 117 yards, notching two touchdowns and one interception. Umpleby caught three passes for 52 yards and junior Pat Whalen (West Chester, Pa./West Chester East) also added three catches. Puckett ran 22 times for 118 yards and he finished 12-of-20 passing for 167 yards and two touchdowns. Petties-Jackson caught four passes for 81 yards for the Cougars. Junior Matt Malecki (Stevensville, Md./Kent Island) finished with 10 tackles to lead the defense, also notching one breakup. Schron added seven tackles and a sack and Troutman posted six stops and an interception. Freshman Michael Ward (Edgewater, Md./South River) posted five stops and three breakups. Picarillo led the Cougars with 11 tackles, one for loss and a fumble return and Brandon Salazar, Rob Hart and Sean Weg each posted nine stops. The Warriors wrap up their home slate on Saturday, Nov. 8, with Senior Day against Lebanon Valley. The MAC contest begins at 1 p.m. at David Person Field.